As the Director of Broadcast Partnerships at Google, Julie Sterling is responsible for some of the companies largest programmatic and video partnerships. She is a highly accomplished executive with 20 years of experience in media with expertise in digital strategy and technology platforms. Julie and her team work with top media companies to provide innovative solutions that deliver revenue growth using the DoubleClick suite of solutions. She also facilitates cross functional partner alignment with other product areas including: Google Play, Cloud, Android, YouTube, etc. 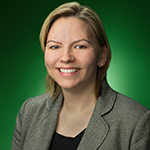 Previously, Julie managed Google's Automotive and CPG team as well as strategic partnerships for DoubleClick across multiple verticals. Prior to joining Google, Julie worked for Kantar Media where she managed top agencies and marketers and created syndicated and custom research tools. Julie earned a bachelor's degree in International Business from The Rochester Institute of Technology and lives in South Orange New Jersey, with her wife and 2 sons.